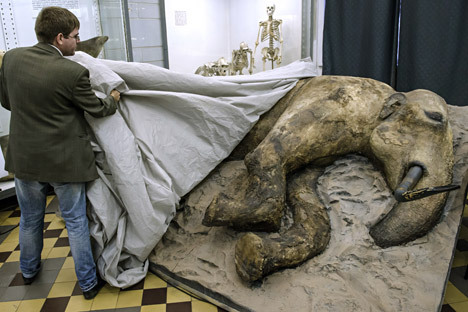 A stuffed young male mammoth found in August 2012 in the estuary of the Yenisei river in Taymyr Peninsula is presented in the Whale Room of the Zoological Museum in St. Petersburg. The carcass of the 15-year-old adolescent mammoth was found by Zhenya, a son of a Nenets caribou breeder, thus the extinct animal was called after the boy's name. Using the remains of a mammoth and an ancient wolf, Russian scientists have found that the Arctic region was first inhabited 45,000 years ago, 15,000 years earlier than previously thought. The results of the research, conducted by a group of scientists led by Vladimir Pitulko at the Russian Academy of Sciences' Institute of Material Culture in St. Petersburg, were published in the Science journal on Jan. 15, a spokesperson for the Federal Agency of Scientific Organizations told Interfax. The scientists analyzed the remains of Mammoth Zhenya found on Cape Sopochnaya Karga in the mouth of the Yenisei river and the bones of a wolf found on the Yana river. Both samples contained traces of human hands: the mammoth bore characteristic signs on the shoulder blade, ribs and maxillary bone; the wolf's skeleton contained a hole made by ancient people. "Both finds - both the mammoth and the wolf - are dated at 45,000 years old. This means that during that epoch humans had already inhabited the Arctic. It was previously thought that this occurred 15,000 years later. Scientists also believed that the territory of human presence in that region was limited to 55 degrees northern latitude. The remains of the mammoth and the wolf show that people lived at 72 degrees northern latitude as well," the Agency said.